The NPA team – Zoe Davies, Lizzie Wilson, Georgina Crayford, Andrea Vickers and Ed Barker – had a busy and productive couple of days at the Pig and Poultry Fair. The stand, shared with Pig World, received a steady stream of visitors, including plenty of members wanting to catch up on key policy areas and discuss issues with their businesses. 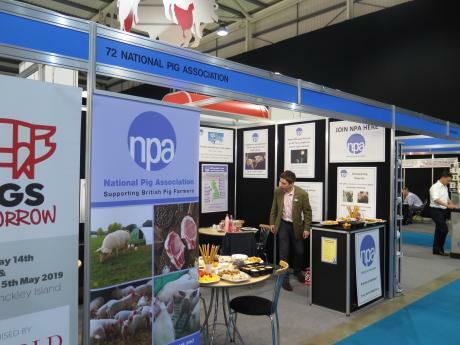 “Andrea, in particular, did a sterling job getting members who visited the stand to use the NPA materials on offer, including logos, and to recruit new members,” Zoe said. There was fresh information on key topics on offer, including the NPA’s recently-submitted 53-page response to the Command Paper, and an update on antibiotics, put together by Georgina. There was advice compiled by Lizzie to help producers protect themselves from being targeted by activists and manage incidents better when they do occur. Zoe Davies added: “Overall, it was an upbeat event and the team did a fantastic job, while also carrying on with their day-to-day work. There was certainly a buzz about the place and that was reflected on our stand, which was busy from start to finish! Georgina, who appeared at the RUMA stand during the show to give her insights into antibiotic usage in the pig sector, welcomed the excellent news on Tuesday regarding progress made towards antibiotic targets. She said: “This figure demonstrates the continued hard work and commitment displayed by pig farmers, aided by veterinarians and other farm advisers, to use antibiotics more responsibly. At the end of the first day, the NPA hosted a reception on the stand, during which Allied Industry Group chairman Hugh Crabtree made presentations to people who had served on the group until March -Dan Day (A-One), Phil Woodall (TVC) and Richard Pearson (Garth Veterinary Group). Ed delivered his insights into how the Brexit negotiations are progressing and the potential implications for pig producers during packed ‘Pig Outlook’ forums on both days. He explained how the way the Commons is currently stacked means the Government will struggle to get all its wish list approved in Parliament, let alone signed off by the EU-27. He again highlighted how resolving the Irish border problem will go a long way to defining the final Brexit deal. Speaking alongside fellow panelist Andrew Saunders, Ed highlighted some of the opportunities Brexit will bring for the pig sector, including new export markets and new Government funding streams, but also some of threats, including reduced access to EU labour and the potential for cheaper imports produced to lower standards than permitted in the UK. He also stressed how the Government’s current stance of pursuing trade policies that deliver cheap food for consumers, while also seeking to push up British production standards could prove to be contradictory. The Government appears to ‘want it all’ with its various aspirations, but the inevitable trade-offs mean it is unlikely to get it, he said. Chairman Richard Lister was busy, too, touring the Fair on Tuesday as one of three judges (alongside AHDB’s Nigel Penlington and me) to judge the Pig World New Product Innovation Award. You can see who won it here.